After closer inspection I've deduced that the following 75 minute movie made in 1932 was Directed by: Graham Cutts; and Starred: Arthur Wontner, Isla Bevan, with Ian Hunter. And how did I know such a thing? Well, I purchased a copy and watched it of course. And so should you, too. Now calm down, Ms Morstan (Isla Bevan). Please. There's no need for you to cry anymore. You're safe now, and completely out of harms way. Although I wish I could've said exactly the same thing about some of your relatives. Well, quite time ago your father partnered-up with a Major from the British army called Sholto (Herbert Lomas), so they could both steal a box of treasure from a known felon named Small (Graham Soutten). However, during this arduous encounter Sholto murdered your father -- in cold blood -- and spent the reminder of his days over here in London. Yet, the strange thing about this, my dear, is that as the years passed by he eventually came to the realization that his life of luxury was built on very fragile ground. And so, when it finally came time for Sholto to take his final breath, he told his two sons about what he had done, and they -- in turn -- hastily decided to send you some of his loot -- in the form of a diamond necklace -- for fear of Smalls return. Of course, Small did return, didn't he? And that's why you're here to see me today. Cause earlier on one of his tattooed henchmen approached you at your florist's. But please, don't concern yourself, Mary! 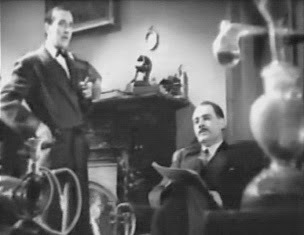 I will now leave you in Doctor Watson's (Ian Hunter) more than capable hands, because what next transpires all begins anew when I say to myself those immortal words, 'Come Sherlock (Arthur Wontner). The game is a foot'. 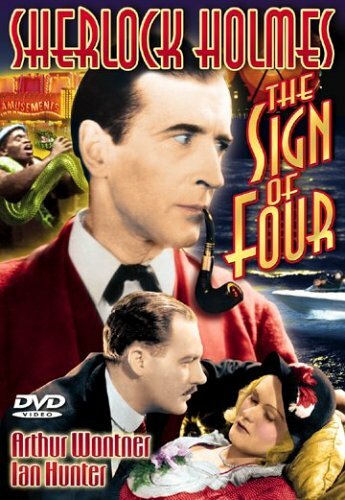 As an inept policeman makes a wrong arrest - a drunken Sherlock becomes a damn right pest - Watson and Mary take a trip to the fun-fair - and at the end of the day, a kiss from a fair lady, spells that love is in the air. I'm afraid to say that this will be my last Arthur Wontner 'Sherlock Holmes movie review' because there isn't any more for me to see. It's a shame really, isn't it? 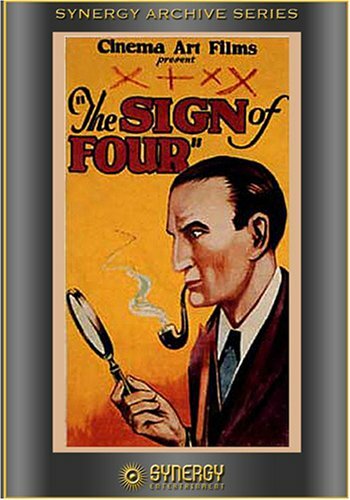 Because on the whole most of them conveyed somewhat intriguing story-line's that lavished us with pathos, mystery, plus an authentic vibe spearheaded by Arthur's portrayal of the Sherlock Holmes character. Take this film for instance. 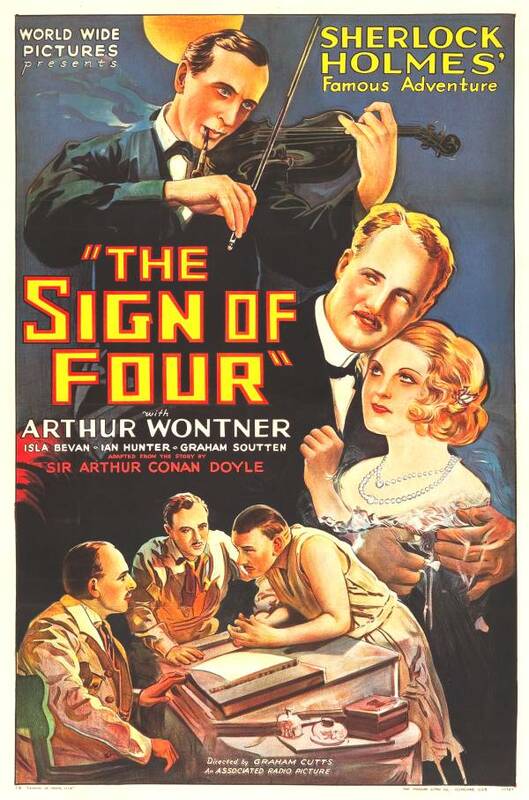 'The Sign of Four'. In it, you will see him doing everything Sherlock does in the books. You will see him poking fun out of Watson and the police without a care in the world. You will hear him making one of his many articulate yet engrossing summations that'll make anyone go, 'Wow! And you'll even see him dressed-up as a drunken sailor and mixing in with the locals. But having said that, dear reader, do you know what impressed me the most about this mystery? It was the fact that the camera-work on show was very innovative for its time. Every now and then a scene was shot from a high perspective looking down to give it a sinister edge. Other times the film was sped-up to give it a more kinetic flow. And here and there you could see Sherlock -- or one of the other characters -- through an object which was placed in the foreground, as if to give this scene a more artistic flourish! Also, something else I best mention about this movie was how Doctor Watson kept on flirting with the Mary Morstan character. Honestly, my friends. When I saw what he was doing I couldn't help but cheer him on and applaud his more debonair antics. And without giving anything away, at the very end of it a friendship was sealed in a very 'to be continued' sort of manner. Now on the flip side of things there were two aspects about this adventure I wasn't too keen on. Firstly, on occasion the sound quality was rather mumbled in note, and difficult for me to hear what was being said. And secondly, I had to wait for over twenty minutes before I could see Sherlock in front of the camera. Apart from that though -- hey! -- this was one hell of a marvellous movie. And these are its filmic-facts. (1) 'Associated Talking Pictures' first released this production in London, England, on the exact same month Al Capone entered Atlanta Penitentiary convicted of income tax evasion. It was in May, 1932. 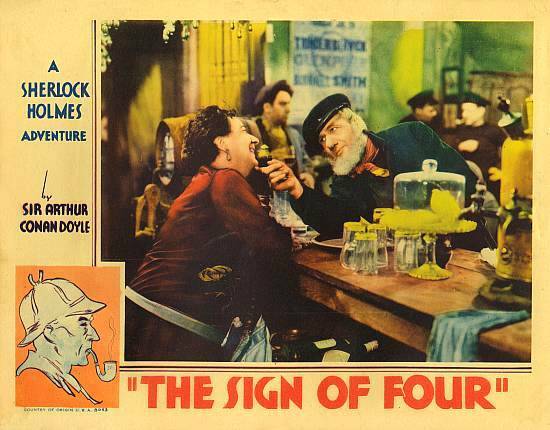 (2) This flick was loosely based on Sir Arthur Conan Doyle's second Sherlock Holmes story, 'The Sign of the Four', which was published by Lippincott's Monthly Magazine, in February, 1890. (3) The majority of this movie was shot at 'Ealing Studios', situated within the English city of London. (4) I'm afraid to say that this adventure made one grievous factual error. Sherlock Holmes' residence isn't located at 22A Baker Street; it's located at 221B Baker Street. (5) To follow on from my previous fact, you might like to know that this movie makes three slight departures from its original source material. Firstly, Sholto doesn't murder Morstan. Secondly, 'The Tattooed Man' doesn't make an appearance. And thirdly, it was set in 1887 and not the 1930s. (6) From 1914 to 2001 this story was re-made ten times in total. (7) This was the first feature length film to star the Shakespearian actor, Roy Emerton. 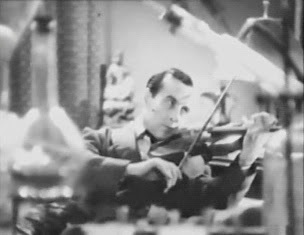 (8) After this adventure saluted King and country, Arthur Wontner starred in the next Sherlock Holmes film, 'The Triumph of Sherlock Holmes'; Isla Bevan starred in the filmic-short, 'The Star Reporter'; and Ian Hunter starred in the rom-com, 'Marry Me'.